I'm glad I am not the only one who likes to watch old gaming commercials. I think you guys should pretend the podcast is sponsored by retro games and play a few select ads between segments. 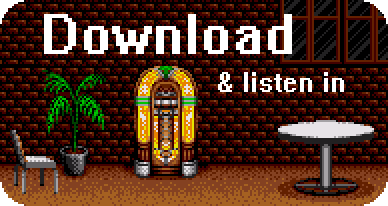 It would be fun to hear some old video game ads in my VGM Jukebox, at least for an episode or two. My favorite old game commercial is for Pole Position. It's so very 80s, like over the top 80s, and works to convince you that rich white yuppies are lame and that playing Pole Position will rock the boat of their status quo and blow their minds with its awesomeness. Another favorite from the 80s is the Nintendo Cereal System. I used to eat this stuff back in the day. It tasted kind of like a milder and less crunchy version of Trix or Cap'n Crunch. Be careful watching this video because the song is stupid, but super catchy. Decades have passed and I still quote "Super Mario JUMPS!" from this commercial. And here's a controversial video: the Dr. Mario witchdoctor ad. I cringe at the racist images of a man in makeup that makes his skin look darker and wearing bone through his nose to look like an African witch doctor, but I used to enjoy the bounciness of the music in this ad. I still think it is catchy, but ugh, yeah, racism. I just finished the episode, and WOW! Zatch and Duck Hunt Davey! You guys rocked it! It's always hard to convey enthusiasm through internet comments, but please try to imagine me listening to this podcast in my headphones, standing up and applauding in my house, and shouting "WOO!" with a big smile on my face. Gerudo Valley was probably my favorite song in Zelda: Ocarina of Time and you guys nailed it. Kirby Air Ride is frustrating? I thought it was pretty easy, too easy, really. Then again, I never tried to unlock EVERYTHING, so maybe that's where the frustration comes from. The track you played is directly taken from Kirby Super Star, stage 1 of Revenge of Meta Knight. It plays as a bonus tune in the Machine Passage stage when you play as Meta Knight. Anyway, that track is one of my favorite Jun Ishikawa tunes and I listen to it all the time. I completely agree about fighting games having misunderstood music. Fighting game soundtracks are honestly some of the best, imo. I think the stigma against fighting game music comes from holier-than-thou RPG fans who only like music that will move them to tears with symphonic strings, Celtic flutes, and wind chimes, and hate anything with an electric guitar, synthesizers, or break-beats. I am half-joking, of course! RPGs have great music, but so do fighting games! Freedom Planet has been on my "to play" list for a while, but I don't really have any means to play it. Its OST pretty much nails the 32-bit era Sega sound. If the Saturn had an exclusive 2D Sonic game, it would've sound like Freedom Planet. And lastly, that Gerudo Valley arrangement was pure MAGIC. Amazing! Speaking of videogames making you nervous when friends are around: I rarely perform well in video games when people are watching me, especially if they are generally better at them than I am. Basically when the stakes are high, I'll probably choke. Josh, perhaps the reason you're thinking of kung fu movies when you hear the marimbas in Tekken five has to do with Crouching Tiger, Hidden Dragon? That opening scene established percussive, rhythm – centric music with fight scenes. I don't remember that ever happening before that film. Emily, Tekken isn't really slower than a typical fighting game; it's just heavier. The way they do motion capture in the Tekken games makes it feel like you're fighting with 700-pound marionettes. So you were asking about commercial memories. The first game commercial I remember was for Zelda, that had a guy in black clothes and a curly mop darting in and out of each shot calling out for Zelda. The first game commercial I cared about was for the Master System and had a clip of Phantasy Star. But my favorite game commercial of all time, and the one that evokes the most nostalgia in me, is "The Maker"; the first Genesis commercial for the US market. Here's the link, but be warned: the audio quality is really poor (https://www.youtube.com/watch?v=CHM4V0ExSJY&spfreload=1). Since we're speaking of game commercials, I mentioned this before but I'll say it again: you know the "Se----gaaaa" jingle at the beginning of the original Sonic? I thought that was created for the game, but it turns out that jingle is quite a bit older. Look at these old Japanese Mark III and Japanese Master System commercials. That jingle plays at the end of each one(https://www.youtube.com/watch?v=1oYbEbZjjXs). Also note that the Sega Master System came out in Japan, which totally blew my mind. I had previously thought that the Mark III was the SMS in Japan, but after the SMS came out here, they liked it enough that they released it in Japan as well. Emily, I am guessing the first time you heard "______mun" was in The Little Mermaid, when Ariel's dad said, "I consider myself a reasonable mermun....", just before he destroyed her collection of landlubber keepsakes. That's where I first remember hearing it, anyway. Josh, speaking of anime, on whom should we crush in Akira? Or Legend of the Overfiend? Zach and Duck Hunt Davey, mad props to you. Way to pull magic out of thin air. Lastly, check out this week's episode of Retronauts. It's about curating Video Game Ephemera. The Gerudo Valley Theme had me shedding a single tear at the end of this episode. Thank you Zach and Duck Hunt Davey.